Vanderbilt’s stout defense almost completely shut down 18th-ranked Kansas State Saturday night, while a late touchdown gave them a 14-7 win and their first 3-0 start since 2011. 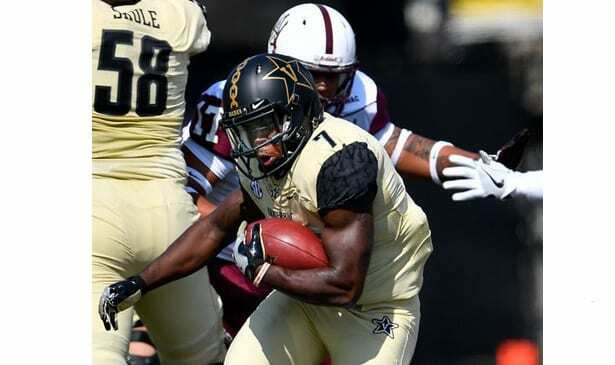 The Vanderbilt Commodores got a historic victory Saturday night in Nashville, defeating 18th ranked Kansas State 14-7. The game wasn’t secured until linebacker Oren Butler and safety LaDarius Wiley tackled Kansas State QB Jesse Ertz one yard short of a first down on fourth down inside Vanderbilt’s 20-yard line. It completed a series of defensive stands that held what had been a potent offense coming in to a lone touchdown. “I threw my hand up and said “Thank you Lord,” Vandy head coach Derek Mason told USA Today. Kyle Shurmur scored the go-ahead touchdown on a two-yard run with a little over eight minutes left. Shurmur actually salvaged what had been a fumbled snap, catching Kansas State by surprise. That also culminated a defensive struggle that saw both teams unable to score through much of the game. The victory was Vanderbilt’s first over a nonconference ranked opponent since beating North Carolina State back in 1946. The Commodores have also won five straight home games and two straight over Top 25 teams. They are 3-0 for the first time since 2011, but will now face number one ranked Alabama in Nashville Saturday. The Tennessee Volunteers twice overcame 10-point deficits in the fourth quarter against Florida, and scored the tying points with 55 seconds left. But somehow Tyrie Cleveland managed to get behind the Tennessee secondary and catch a 63-yard bomb with no time remaining, giving Florida a 26-20 win and its sixth straight over the Volunteers in the Swamp. Tennessee missed three field goals and had an interception returned for a touchdown. “We’ve got to start scoring touchdowns rather than relying on long field goals,” Tennessee head coach Butch Jones told USA Today. The Volunteers also had a stretch of three trips in the red zone that earned them only three points. The Volunteers know this one was there for the taking. They just weren’t able to do it.